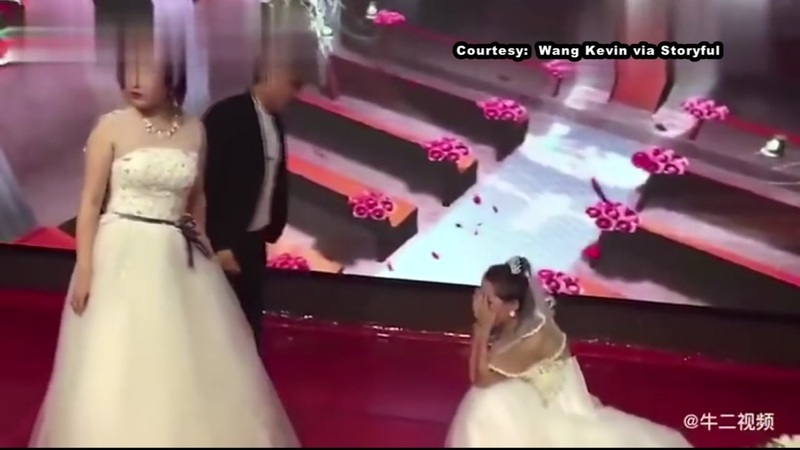 A woman in China took the words "speak now or forever hold your peace" to heart when she tried to win her ex back on his wedding day. Video shows the emotional ex-girlfriend yelling at the groom, trying to convince him not to get married while his bride looks on. The woman, who was dressed in her own wedding gown, even got down on her knees as wedding guests reacted in shock. The ex-lover stormed into the wedding ceremony when the groom was about to kiss his bride. The bride, not wanting anything to do with the drama, ended up marching out of the ceremony. The couple is now trying to work through what happened, and the groom said he hopes to have a wedding redo soon.